The 2018 Mazda6 is a vehicle that will impress you with its advanced suite of smart safety technologies. From smart high beams to smart braking, you'll feel confident that you'll stay out of harm's way on the road. 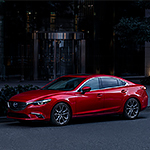 The Mazda6's i-ACTIVESENSE safety technology includes convenient smart features like High Beam Control and Adaptive Front-Lighting that keep the road well-illuminated at all times. It has active technologies that avoid or mitigate accidents like Smart Brake Support and Mazda Radar Cruise Control with Stop & Go. It also has your back with Blind Spot Monitoring and the Lane Departure Warning System. We invite you to pay us a visit at our showroom in Reading for a tour of the 2018 Mazda6 and arrange a test drive. At Piazza Mazda of Reading, our friendly salespeople will be happy to help with any questions you have.